Welton David Becket (August 8, 1902 – January 16, 1969) was an American modern architect who designed many buildings in Los Angeles, California. He moved to Los Angeles in 1933 and formed a partnership with his University of Washington classmate Walter Wurdeman and Angelean architect Charles F. Plummer. Their first major commission was the Pan-Pacific Auditorium in 1935, which won them residential jobs from James Cagney, Robert Montgomery, and other film celebrities. Plummer died in 1939. The 3,000-seat Santa Monica Civic Auditorium, Project Designer Lou Naidorf, opened in 1958. After Wurdeman's death in 1949, Becket formed Welton Becket and Associates and continued to grow the firm to the extent that it was one of the largest architectural offices in the world by the time of his death in 1969. In 1987, his firm was acquired by Ellerbe Associates, and the merged firm continued as Ellerbe Becket until the end of 2009, when it was acquired by AECOM. It is now known as Ellerbe Becket, an AECOM Company. Becket's buildings used unusual facade materials such as ceramic tile and stainless steel grillwork, repetitive geometric patterns, and a heavy emphasis on walls clad in natural stone, particularly travertine and flagstone. With The Walt Disney Company and the United States Steel Corporation, Becket's firm co-designed Disney's Contemporary Resort, which opened in 1971 at Walt Disney World Resort. The Contemporary was designed as a 14-story steel A-frame with a monorail running through the building. Modular guest rooms were assembled, finished, furnished, fully equipped and their doors locked, on the ground, then lifted by crane and inserted into the frame; however, this sometimes took multiple tries. Becket's sons, Welton MacDonald Becket & Bruce Becket, are also practicing architects, as well as his nephew MacDonald G. Becket and granddaughter Alexandra Becket. The 13-story Capitol Records Building, Project Designer Lou Naidorf. 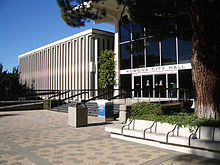 City Hall Pomona, California, built in 1969, designed by Welton Becket and B.H. Anderson as two buildings joined by a central glass pavilion, Project Designer Marvin Taff (photograph taken in 2004). Glendale Central Library, Project Designer Marvin Taff, finished March 13, 1973. Park Plaza Mall, Oshkosh, WI, 1970, now City Center a commercial business center for Oshkosh. ^ "Welton David Becket , Sr". Pacific Coast Architecture Database. Retrieved 9 April 2014. ^ Timberg, Scott (10 August 2002). "A Toast to a Man Who Left His Imprint on L.A." Los Angeles Times. ^ Reynolds, Christopher (6 March 2003). "L.A.'s Invisible Builder". Los Angeles Times. ^ a b c d "NEWSLETTERS – "Webb Spinner" – Del Webb Sun Cities Museum". delwebbsuncitiesmuseum.org. Retrieved 2018-07-30. Wikimedia Commons has media related to Welton Becket. Becket's Cinerama Dome, with Shrek 2 decorations.